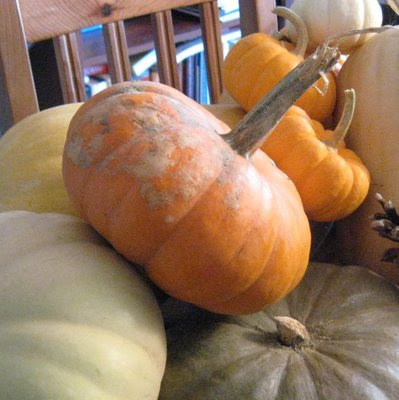 On a recent visit to a local farmer's market I learned that the "Cow Pumpkin" (white pumpkin above) is actually what canned pumpkin is made from. According to the farmer, it's "much sweeter, and has a better texture." 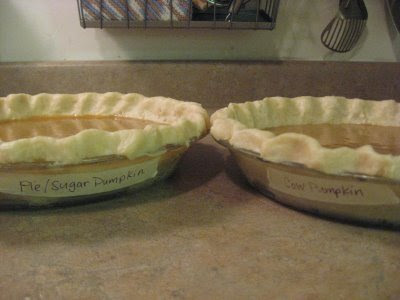 Since I LOVE pumpkin pie, I decided to see if there really was much of a difference. Cutting into the Pie Pumpkin was a NIGHTMARE! The skin was tough, and my knife kept getting stuck. The good news; it was small enough that I could steam the two halves and scoop out the "meat" without having to peel it. It also had the very familiar aroma of carved pumpkin. 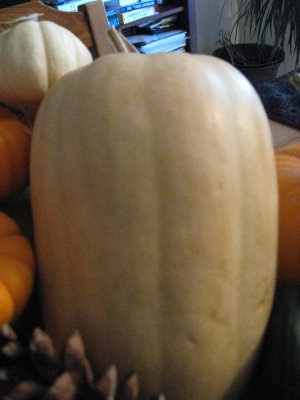 The Cow Pumpkin was like cutting into a cantaloupe. It was soft, smooth, and cut up nicely. It was really juicy, and smelled really sweet too. 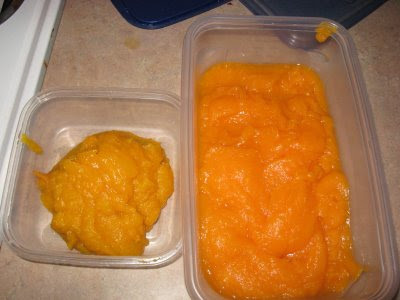 The puree had an obvious difference. 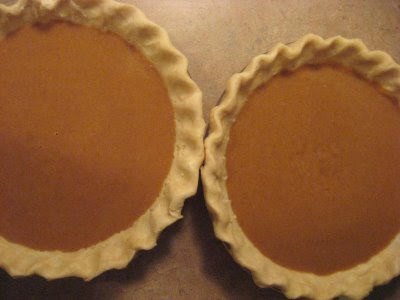 The Pie Pumpkin (left) was lighter, more solid, and obviously yielded less because of the size of the pumpkin. 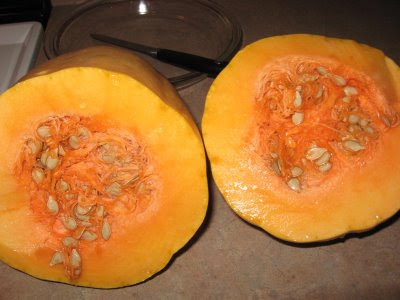 The Cow Pumpkin (right) was darker, juicier (I had to strain this longer to remove excess water), and smelled much sweeter. 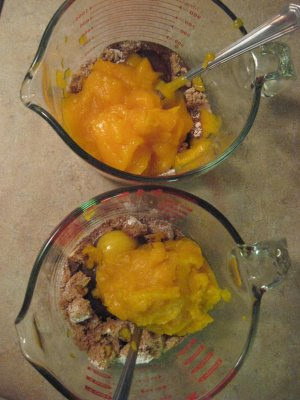 Once mixed, they looked virtually identical. 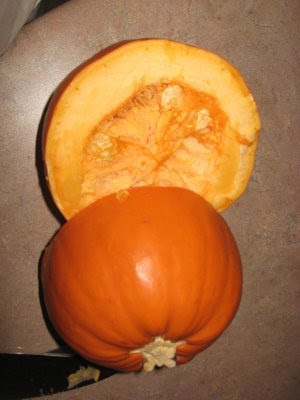 However, they did smell different, the Cow Pumpkin, smelled a little sweeter, and more traditional. I was REALLY excited about this part. I gave a test offering to my "better half" and he asked "where's the whip cream?" I guess he just wasn't into it as much as I was, however the results were unanimous. The Cow Pumpkin had more of a custard texture (I'm guessing this is because of the amount of water in the puree), and it was slightly sweeter. 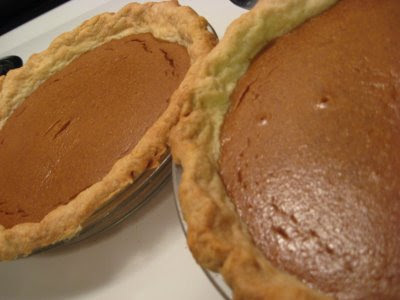 The Pie/Sugar Pumpkin was a little more solid, like a traditional pumpkin pie, and cooked up a little faster than the Cow Pumpkin. All in all, they tasted virtually identical. If they weren't labeled, I wouldn't be able to tell them apart. So if you don't have access to a farmer's market, and you're only option is a Sugar Pumpkin, or even the pumpkin you carved for Halloween, don't worry, it'll taste just as good. The moral of this story: Don't let a farmer tell you that a "Cow Pie" is just as good as a "Sugar Pie"!